Whether they're trying to hide some gray or embrace a new or quirky color, people adore hair dyes. But some of these dyes may be harmful to humans and the environment. Now in a study appearing in ACS' Journal of Agricultural and Food Chemistry, scientists report that they have developed a natural, non-toxic hair dye derived from blackcurrant skins that is as durable as conventional dyes and capable of sustaining hair color through multiple washings. More than 5,000 substances are used to make hair dyes, according to the National Cancer Institute. Although human studies are inconclusive, findings suggest that some of these ingredients may promote cancer in animals. In some cases, these dyes can also trigger allergic reactions in humans. And, research suggests a large percentage of these colorants simply go down the drain, eventually ending up in rivers, lakes and streams where may pose an environmental hazard. To address these concerns, Richard S. Blackburn, Christopher Rayner and colleagues at the University of Leeds sought to create a natural, sustainable hair dye made from blackcurrant skins, which manufacturers usually discard after juicing. The researchers extracted and purified a group of pigments from the skins called anthocyanins, which commonly produce colors ranging from pink to violet in fruit, vegetables and flowers. 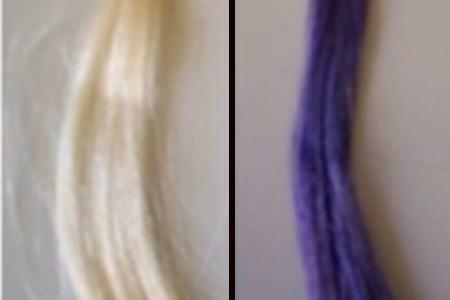 The team used these pigments in a dye paste and applied it to bleached human hair, producing a vivid blue color, and they could produce reds and violets by modifying the dye formulation. There were no significant changes in these new hair colors after 12 shampoos. After analyzing how these natural compounds fix to the hair, they concluded that anthocyanin-based blackcurrant dyes are comparable to conventional colorants and could become an important component in dye mixtures used to produce a variety of hair colors and shades. The authors acknowledge funding from the Department of Environment Food & Rural Affairs and Innovate UK.